Vote: Who will cave first, Obama or Boehner? It's the eighth day of the the partial government shutdown, and President Obama says he'll only negotiate with House Republicans if they allow a vote to reopen the government and agree to raise the debt ceiling. 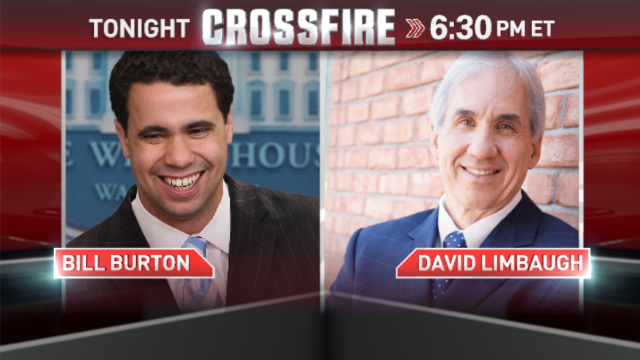 In the Crossfire tonight at 6:30pm ET, Former Deputy White House Press Secretary and Democratic strategist Bill Burton, and author, columnist and attorney David Limbaugh, who is Rush Limbaugh's brother. Burton supports the president's refusal to negotiate, while Limbaugh says Republicans should force him to the table. Who do you think will cave first, President Obama or Speaker Boehner? Vote below or Tweet your response using #Crossfire. On a mobile device? You can vote and view results on our Poptip results page. Actually they are doing their jobs, looking out for our constitutional rights. You want to be treated equally under the laws of this country correct?? of course. we all do. But that's not whats happening with Obamacare or if you like would the A.C.A., it has been changed from it's original form as passed and altered to favor one group of people over another group of people, thus treating some better than others, enforced on some but not on others, this is what this whole things about. The right thing to do is enforce it on everybody the same,all at the same time, but Obama don't want to do that. He wants to give the rich a year pass on the law, but not the people, or should i say the poorer people of this country. By doing what he did, he in fact altered the original law as passed into an unconstitutionally enforced law... Do you really think this is fair a law for some but not all. I don't. So why not just give everyone that year??? yes . But in my own view this law is a stupid law when it comes to the economics of it.. peace be unto you. David Limbaugh destroyed his effete, Democratic (am I being redundant) opponent with a volley of intellectual buckshot to the gut. Please offer him a regular slot. He would give you a consistent, opinionated and greatly entertaining conservative voice...and a reason for us conservatives to actually tune in to CNN! How could you frame such a question as a responsible American? In doing so, you have reduced staesmanlike behaviour to seem like cowardly "caving in'. How could you ,as an American frame a question like that.It suggests that whoever acts like a statesman is caving in!! David Limbaugh is just as moronic as his brother. Comparing the Tea Party to Reagan republicans is a joke. He stated that they are concerned about the debt, spending, etc. just as Reagan was. The fact that Reagan increased our debt by 300% in eight years seems to escape them. In comparison, Obama has only increased the debt by 75^ in his first 5 years. That with two unfunded wars, and the second great depression. These radical right followers like Limbaugh and his brother refuse to see the facts. They refuse to accept the validity of math, a non-partisan, factual proof of numbers. As far as Obamacare, he claims it is all lies and that it does nothing Obama said it would. False and without fact. Obamacare will help tens of millions of Americans, period. The recovery from the GOP created economic disaster created by 0ver 30 years of failed republican economic policies. The last depression took a world war and over 10 years to recover from. Maybe these idiots need to realize that when the top one or two percent take all of a nations collective wealth, they slowly wipeout the middle class, leading to a nation divided by two very distinct and separate social classes. History has shown us time and time again what happens when the wealthy class takes to much from the common people, revolt. Please explain to me how Obamacare is going to help so many people??????? I would love to know!!!! My insurance premium doubled and my deductible tripled!!!! I would like to know what the IRS has to do with my healthcare???? Who is going to subsides these uninsured people. We'll Rob I am no Brain Surgeon but it looks like I am!!!! With my new premium payments!!!! ( that I can't afford now) Btw I am sure you probably work for a corporation and healthcare hasn't changed on you and your family YET!!!!! Keep in mind our such fair President gave the Corporations and Unions a pass for now!! When it starts hurting you in the pocket book like it is affecting me and other Americans. I am sure you will be singing a different tune. Neither will. so 'caving' goes to the economy. The GOP messed up by attacking Obama so fiercely, that Obama has nothing to lose. Any tactician will tell you this is a bad strategy, resulting in a higher cost. This is why both sides have such a hard time working things out. The press adds fuel to the fire with all this talk of "caving" and "who blinks first". This is not a boxing match or some schoolyard tussle. I know that the press needs something to write about, but they could at least be constructive. I've listen to the Republicans talk about the people don't want aka Obama Care, but here's the problem 65 million people did. That's the number of voters; voted for the President and his Health Care Act. It has been debated over 40 times and now it's the law of the land. If they can come up with 66 million votes, then we can talk until then let it go. The Neo – Tea – Con – Republicans because they are week! It seems you've fallen in the mainstream's influence of telling halve truths, here's basically what's happening; a law was passed, even to the supreme court ,it's settled law. Then Obama looking out for big companies changed the law taking a part of it out for a year for these big companies, but not for everyone effected by the law, "not for the ordinary Americans", us. Now it's a law that's being applied unequally after being changed unconstitutionally . It altered the original law that was passed, favoring one group over another, Thus making it unconstitutional as a law. I'm thankful that we have one small brave group of responsible people stand up for what's only the right thing to do. Either enforce the law as originally written or give everyone that year as well !!!!!!!!! But I also really feel that this law is really stupid for the economics of it. Heard about this show through advertisements. Thought I'd try it out. Watched last Fri. Jessie ventura, really. I tried one more time tonight. I was under the impression this was a serious debate program and would be intellectually stimulating. Wrong! Typical partisan fighting with all the usual soundbites. Democrates win. If I hear the word "hostage" one more time I'm going to think it's the most popular word in Websters. At least they are consistant in their rhetoric. Yeah, another loudmouth, run-on, obnoxious ultra conservative Limbaugh. Guh. Rush should be hushed. So, please ditch David early, so I don't have to hear, "no, no, no, no, no" yet again. That is what this fight is all about. The rich are willing to see the government fall just so they can get richer. And the republicans are their willing lap-dogs! They will fight anything that helps the poor and hurts the rich! No i just want to be treated the same under the law, any law; lets say robbery. I rob a bank and you rob a bank, you get charged with braking is law and given ten years in prison, But I am rich and the law was changed after becoming law by one man, now I don't get charged for robbery and keep the money too. How do you feel now ?????? David Limbaugh's assertion that democracy is "an adversarial system" displays a profound misunderstanding. He's a lawyer and that is an adversarial system designed to display "the truth". Democracy is a collaborative system designed to formulate "a solution". Secondly, 40 failed attempts to repeal Obamacare speaks for itself. Thirdly, Obamacare is essentially a Republican plan offered in opposition to the Hillary Clinton plan. It was adopted in MA and signed by Romney. A party which posits an adversarial system cannot claim that it is being "collaborative". What we are seeing is just a symptom of a greater problem. The growing conflict of the have-nots against the have's. The rich and their republican represenitives do not get this. A real civil war is brewing in this country. The poor are fed-up with the rich just getting richer. And are beginning to realize the only way to change that is to go out and take it by force. You will see much more growing violence against the rich perpetrated by the poor. This will get really ugly and the symptoms are there for all to see if you are looking! we all just want to be treated equally under the law, the rich or the poor. don't you? If it's a law it should be everyone is treated the same under that law, if not then it's a unconstitutional law. Your choice of David Limbaugh as a guest on Tuesday was really a service to the Democrats! He's a great example of Tea Party Republicans- OFF THE WALL! You know democrats are running the Crossfire show when *caving* or winning is the only headline worth attaching to the debate. Shallow. When am I going to hear something about the IRS losing over $67 Million dedicated to funding the ACA...you know, something relevant to answering and overcoming objections. Coverage went from 80/20 to 70/30 when this happened. If we're taking something for a *test drive* right now, the ACA car won't even start! I know what you mean, I couldn't believe it at the end, and that's all, who's going to cave first, are you kidding me. I agree with you. David Limbaugh actually looked and sounded a lot like Gilligan (the older version) from "Gilligans Island". His Tea Party just wants whats best for America ?? As long as it is exactly what they want too ! They are totally acting like spoiled rotten kids. What are we doing both sides has to give, the Republicans will do any and everything to try to make Mr. Obama look bad they will never get over him winning or being re-elected get lest's get over it, he won. Yes, he won. But Republicans also won a majority in the House because the American people want a balanced government, not completely controlled by either side. Just because Obama won doesn't mean Republicans need to give in to his every demand. Both sides need to compromise and come to an agreement. That's tough to do when Obama won't negotiate. Does he really think Republicans are stupid enough to fall for the "give me what I want now and I will negotiate with you later" routine? He manages to look really bad all by himself; no help necessary. The New York Times reported that this summer the shutting down of the government and not approving a debt ceiling bill was a Republican Party developed strategy. Now they are trying to say that Obama won't negotiate. Since this whole mess is the Republican Party strategy, I would let them hang themselves with it. "They" are not saying Obama won't negotiate. Obama is saying that himself. He could get 90% of what he wants if he'd just be willing to come 10% toward the other side in a compromise. Then he would truly be a leader. I don't call looking out for our constitutional rights a strategy, I'm thankful someone is. Don't you want to be treated equally under the laws, no matter what? Black or white, rich or poor??? So the rich get a pass under this law, but the poor don't. No matter how you look at this law, it's not equal under the law to everyone; Thus it's an unconstitutional law, which was changed after it was passed, by Obama, after it went through the supreme court, how can you do that without altering the original law?? all laws must be enforced equally. all or nothing. Keep them shut down!!!!!! Obama has the upper hand because he has nothing to lose. He can't run again and we all know Hillary is going to win if she runs. The CONservatives have everything to lose. Please tell me your just joking right? If you really vote for Hillary and god forbid she won, it would be another four years of Obama&Bush, policies. Can you honesty say your not tried of this #@%# by now. Man, we need something different in Office, not this same old revolving door into the white house #@%$. New blood. Let's get back to being a nation, a great nation again, and enough of this war crap, and spying on everyone, and waist of money. Please no Hillary too.. I find Republicans to be inept and disillusioned individuals, at the same note I sympathize with the speaker who is the puppet of angry Kids who are bullies. from observations republican have no American interest at heart just selfish orthodox agenda "kill anything that stems success and pronounces the Name OBAMA"
I find liberal democrats to be very generous with other peoples money!!!!!! Let's be realistic,why should my insurance premiums go up double and my deductible go up by three times? I am a single mom that doesn't milk off the government and I pay my health insurance premiums. Why should I have to subside to other peoples healthcare???? Especially people that choose to have a boat load of kids they can't afford. In Obamacare the more kids you have the better deal you get. THAT MAKES ALOT OF SENSE!!! Furthermore why is it ok for Mr. Obama to lie to the American people and say you can keep your existing healthcare when you can!!!!! My plan was not grandfathered in to this train wreak of Obamacare. Mr Obama and his family won't even go on this affordable healthcare crap!!!!! Btw I agree with the comment before mine. You are the kid!!!!! A ignorant kid because it has nothing to do with being against Obama. I also would like to ask you WHAT EXACTLY DID OBAMA DO THAT IS SO GREAT FOR AMERICA? OBAMACARE THAT IS A BIG JOKE!!!! If anyone is the bully it is Mr. Obama he learned that from his time in Chicago!!!! I am a visitor to your country and have been following your current Government fiasco and the possible debt ceiling default. America you arn't looking good. If your President and Congress with the approval of your High Court has approved laws concerning yourObama Care then the current impass, must be a default of your Congress.In Australia if the same blockage of Supply( budget ) happended , there would be grounds to call a Federal Election which would provide a people's mandate. That mandate would then be honoured by the elected government and both house of Parliment would accept the outcome. Your Tea Party is extreme and and I suspect don't care about their great country. Saying you love your country and then taking it to the cliff face and hurting your people might well be treason! In any case American needs to honour its President...he was elected to run your country. If you don't agree with him and his party then vote them out at the next election. In the meantime give honour to his office. Isn't that the tradition of your country that so many people like myself love about your country. I beg to differ with you about the Tea Party being extreme. The Tea Party is made up of traditionalists, people who want to conserve or preserve our traditions and our heritage. How could they possibly be perceived as being extreme while the counter-culture, the extreme left wing socialists who want to radically change our country are moderate? Too accuse the Tea Party of not caring for our country is to be completely ignorant of what they represent. You suggest that we give honor to our president. Obama was given the Nobel Peace Price before even doing one little thing; in the process the Peace Prize has lost much of its integrity. Honor is given to one who deserves honor; if it’s given out gratuitously then it depreciates and diminishes itself. Sir, you declare yourself to be a pastor; to me that is a believer in the Judeo Christian God; a pastor is one who is an advocate and promoter of morality and decency. I truly believe that Obama is a counterfeit president. He refuses to even present his birth certificate, instead he provides a fake one, and that’s just the beginning of his offenses. He calls himself a Christian and his administration systematically attempts to dismantle the manifestations of Christianity. He advocates for gay marriage and abortion. Well said, I agree 100% Thank you for being awake. Mind your own country's business..... Our Healthcare and Deficit doesn't affect you. Furthermore my WHOLE FAMILY fought for this country and have a right to voice their opinion. Judy, you truly need to turn to MSNBC if Newt offends you, because that means you're offended by the truth. CrossFire is adding fuel to the fire by using the word "Cave"... why not ask Who will negiotate first! Media needs to be part of the solution not just making it a game. Obama. Obama is a well known caver. And the Tea Party terrorists would rather cut the baby in half in the King Sulemain story. They'd rather have the baby die than give in. Your spelling is a Terrorist. Have something to add when you grow up. Thanks..
Limbaugh has a nerve saying that this isn't a robust economy. When republicans haven't lifted a finger to help with recovery policies. They've done nothing!! And now they threaten to tank it all.....what absolute losers. Unfortunately, We're going to be the loser's in this out come, if it comes out only the poorer are under this law and not the richer.I'm sorry but we are all under this law or all are not, not just some of us. That's what makes this a great country, everyone is equal under the law, if not than it's an unconstitutional law.THAT'S what's up!!!!! Bill said more ppl have jobs this term with obamn???? Do they list ppl working when unemployment runs out?? ?if so i guess ev one is working. I hope CNN goes for the truth in these matters, does the research reports the truth to the American People! Bill said ppl voted obama in ? how many of the votes came from ppl he alowed to stay here from Mexicoshow id see who wins,and you can tell obama owns the media. I think Limbaugh is just as dumb as his brother !!!!!!!!!!!!! the American people will cave first ... until the 2014 election Fire Em All!!! The Republicans fought an unfunded war and reduced taxes. That's why we have such a high deficit. It was NOT Obama's fault. He inherited the debacle. He did not create it. Carol please you really can't be that ignorant!!!!!! Let's be realistic OBAMA made his own HUGE MESS!!!!! Let's take a look at this OBAMACRAP HEALTHCARE!!!!!! Oh I know it's everyone else's fault not his!!!! I think the American people needs to protect around the republican about their rights and losing their jobs . The republicans already rich and situationed (that's why they don't care). If American people start a protect and pertition and don't vote Boehner in as well as Brown ever again we wont have these problems. They are against AMERICAN PEOPLE GETTING WELL(OBOMA HEALTH CARE) which is insane. When I see Boehner and Brown on voting poles (I will run) they are scary non caring republicans and that god will handle eventally (watch). Who will cave first?! This is not a boxing match or a joke. CNN what happened to you? You used to be a respectable news outlet but now you are touting the upcoming negotiations as a schoolyard fight! You pit our government officials against each-other, goading them and taunting them like its some sort of spectacle for ratings. Oh wait it is just rating to you. I know our government is a circus right now but get back to journalism, real journalism. There is a huge case going on in the supreme court right now over campaign finance “Aggregate” limits. It's called McCutcheon v. Federal Election Commission and its a big deal. It really should be covered by you. Instead of reporting on mud slinging and petty words from congressmen and senators get back in the field and cover the rest of the news. Seriously disappointed. In these United States, we don't negotiate with any terrorists whether tea baggers and/or Republicans! During his press conference today , Obama sounded like he really didn't know what he was talking about . I have concluded now that he really doesn't care about the well being of the American people . It is all about him , his party and legacy. Yes , the healthcare bill was passed by congress and upheld by the surpreme court , however he changed it afterwards , allowing congress to opt out and also gave a waiver to unions and big business. That is an outrage and the Republicans are right in wanting to renegotiate. This whole fiasco is the result of an arrogant and clueless President who doesn't know how to lead. well said. I agree a 100%. Thank you for being awake.